Samsung Electronics is beefing up its foundry business by utilizing cutting-edge extreme ultraviolet technology to attract global IT giants such as IBM and Qualcomm as major customers, according to the industry on Friday. US-based IT mogul IBM Corp. announced Friday that it will use Samsung Foundry’s 7-nanometer EUV process to manufacture power processors for the IBM Power Systems, IBM Z and IBM LinuxONE high-performance computing systems and cloud offerings. 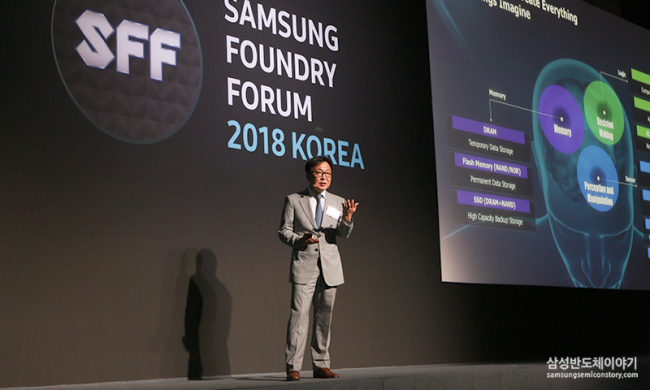 The 7-nm EUV process was a strategic choice for Samsung to expand its share in the global foundry market. The EUV process technology is expected to produce more precise chips than the existing argon fluoride immersion technologies, which are used for high-performance computing systems for big data and artificial intelligence machines. Samsung aims to rise to the No. 2 position in the global market from the current No. 4. At present, China’s TSMC stands at No. 1 with about 56 percent of the market. Samsung also inked a deal with Qualcomm in February to manufacture chipsets for the fifth-generation network on the same process technology. Samsung is currently constructing a new EUV line in Hwaseong, Gyeonggi Province. Construction began in February, and mass production is scheduled to start in late 2019. A foundry business refers to a contract chipmaking service for clients that do not have fabrication lines. TSMC began mass production with the 7-nm process in the second half of this year. According to the industry, Apple has placed all its 2019 orders for A13 mobile processors with TSMC.